The weather is cooling (thank goodness) and if you haven’t been doing a good job of sun protection, it’s time for some damage control. 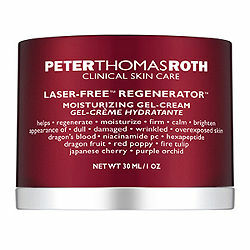 Peter Thomas Roth Laser-Free Regenerator Moisturizing Gel-Cream – This deeply nourishing, pink gel-cream dramatically helps improve the appearance of skin texture, tone & clarity. Helps diminish the appearance of fine lines & wrinkles leaving skin radiant and younger looking. A deal for you! Free Peter Thomas Roth Laser-Free Resurfacer deluxe sample with any $20 Peter Thomas Roth purchase. While supplies last. I am currently using this cream and love it. Researchers have found that Plant Stem Cells extracted from a rare Swiss apple, (Uttwiler Spatlauber), show tremendous ability to stimulate skin stem cells, encouraging aging skin to behave like younger skin. I’m addicted to the fabulous smell as well at the great results. I found it for $24.99 at Drugstore.com – Eclos Anti-Aging Moisture Therapy Regenerative Cream, 2 oz . Have you tried any of these? Feel free to leave a comment about it. ← Check out this box!